Barney Santos was born and raised in the City of Downey, For over 15 years Barney, his wife and his dog live in the City of Montebello. Barney is one to give his time and 100% effort in helping others, while expecting nothing in return. He has spent many hours for free, consulting with the Stay Gallery, an arts non-profit in the City of Downey. As a Marketing Manager at Unilever, business is in his blood. Through the Downey High School Entrepreneurship program, Barney has acted as an advisor and mentor to many deserving young people. Every year Barney is asked to speak at Transform LA, an event for high school students to understand how to be a business owners, through the Network for Teaching Entrepreneurship. Barney has taught classes, mentored student entrepreneurs, and helped students looking for career opportunities. Recently, he was appointed the interim director for Latino Startup Alliance that focuses on helping Latinas and Latinos connect with emerging tech businesses and he is constantly volunteering his free time to advise, mentor and train these budding entrepreneurs. As you can see, Barney has a talent for inspiring and empowering young people to leverage their creativity, courage and critical thinking, to build companies and create their own destiny. Barney feels a sense of responsibility to use his skills to give back to his community, where he and his wife have made roots and will raise their family. He is touching the lives of others, one by one, and providing hope and opportunity for a bright future. 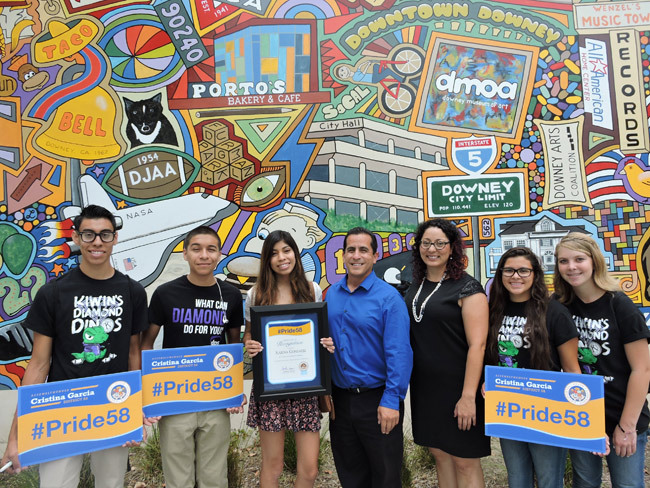 Karina Gonzalez is a 2015 graduate from Downey High School and already is an exceptional young leader. Since sixth grade she has been involved in Kiwanis student leadership programs. In her final year of high school Karina held the position of Diamond Division Lieutenant Governor which entails overseeing 7 high school KIWIN'S clubs and working with presidents to create community service projects. This school year, Karina along with a committee of student leaders created a service project to feed thousands of children in the Philippines who were affected by Typhoon Yolanda. While most teens were out enjoying their summer vacation, Karina and close friend Liz were working tirelessly to find a way to help the children of the Philippines. Under her leadership, the KIWIN'S clubs raised over $8,000.00 and packaged more than 25,000 meals to be sent to the affected areas in the Philippines. Along with those meals the KIWIN'S worked with local Philippines officials to help purchase and deliver thousands of tsinelas (sandals) for elementary school children. Not only that, Karina also rallied her KIWIN'S to send school supplies and hundreds of books with the help of the Molina foundation. Congratulations Karina, you give hope to others and you are an inspiration to your peers and your community. You are a shining example how one person can change the world. Mr. Richard Jarman is true community leader, working as part of the Bell Gardens Faith Based Council and the Bell Gardens Police Department to address crime prevention and coordinated youth activities in the city. Through his dedication to TouchPoint Church, Richard has led in partnering with the Department of Children and Family Services to provide, food, clothing and beds for needy families and children in foster care. In addition, a visitor center has been established for these families, where they can enjoy family fun in a safe environment. He also coordinates the church’s monthly homeless feedings, on the last Tuesday of each month – a ministry that is carried out by a dedicated group of men at the church. Richard also leads his church to hold regular scheduled clothing giveaways so that needy people in the community can have access to good, gently used clothing. To give people in his community free access to computer services and the internet, for homework and job searches, Richard delivered. He went to work with the Southeast Community Development Corporation to coordinate and establish a computer lab at the church. Bringing a day joy to the children and families of Bell Gardens, each year. Richard oversees the planning and execution of the city’s annual Halloween Festival. Over 500 children and parents come out to eat, play games and win prizes—and all free to the community. Richard Jarman has been a wonderful leader & volunteer for many years. His spirit of service and generosity is at work every day, affecting the lives of so many in need. He is a man of action, a role model to many and someone proud to give his best to the people of Bell Gardens. Mala Malani is a successful business woman who has been active in the Indian community for many years. Thirty two years ago, Mala was the first Indian woman to start a clothing boutique on Pioneer Blvd. and has been instrumental in the creation of the now famous Little India in Artesia. Mala is the owner of Sona Chaandi boutique and the very popular Sona Chaandi Threading Boutique, which are both located in her plaza. She designs all the clothes and jewelry herself for her stores. 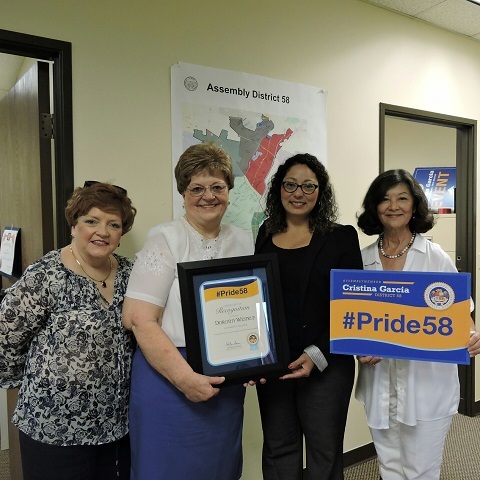 In 2007, Mrs. Malani was able to contribute to the passage of Assembly Bill 265, a bill to make it legal to practice eyebrow threading in California. She was also recognized with the 2007 Woman of the Year in Business award. Mala is also a dynamic activist in social and community events. She has been honored to be keynote speaker for the Artesia High School graduation. 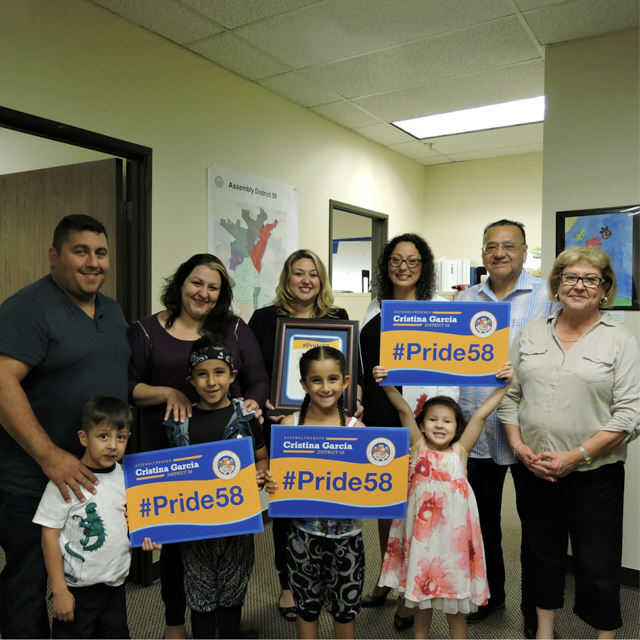 She has also been a committee member on the Advisory Board of ABC Unified School District for the past five years and is a regular participant at city council meetings in the cities of Artesia and Cerritos. One thing many people may not know about Mala is that in 1979 she was the first Indian woman to win the Miss Artesia title, while at the same time, attending the University of California in Riverside, where she earned a nursing degree. In spite of her very busy outside schedule, Mala always puts her family first. She is married, has two children and is the proud grandmother of her newest, favorite bundle of joy, Kaylani. 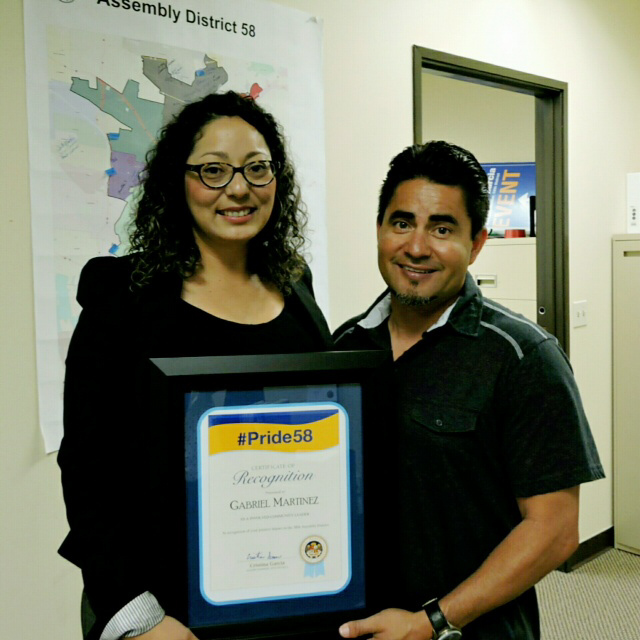 Mala Malani, thank you for being an accomplished and caring member of your community. You are a valued leader and through your many efforts you have made Artesia a better place for people to live, grow and prosper. You exemplify the “Pride of 58”. Gabriel Martinez has been the head coach of the City of Commerce’s Women’s Water Polo team for over 20 years. He is a Commerce resident who is dedicated to mentoring young athletes in his community. He believes all his players can achieve success as long as they work hard for it and he has worked to instill that confidence in the athletes he coaches. In fact, two former Commerce water polo players who trained under Coach Martinez, Brenda Villa and Patty Cardenas, have gone on to participate in the Olympics. Coach Martinez has achieved a successful career coaching in Commerce and he is proud of all his players. Thank you Gabriel Martinez for believing in all of your players and personally investing your time and energy into your athletes. Dorothy Westrup has contributed to her community for many years, to bring culture and art to the City Bellflower. Dorothy has served as President of the Bellflower Symphony Orchestra for over 25 years and does an exemplary job. Her organization recently put on a young artists competition and the winners performed an outstanding concert with the Bellflower Symphony Orchestra at the Bristol Auditorium in Bellflower. Dorothy put in a great deal of time, dedication and effort to produce this outstanding and memorable event. Dorothy is also the President of the Los Mochas Sister Cities. Some of her duties include finding hosts for visitors from Mexico and providing an entertainment schedule and tours for the special guests In addition to bringing the arts to Bellflower, she has also participated in a cultural exchange in Mexico, as part of a visiting delegation. In fact, a few years ago, when one of the past board members suffered from a stroke and there was a great need for chaperones, Dorothy stepped up and has been her constant friend and helper throughout the years along with many of the Rotarians of Bellflower. Thank you Dorothy for your giving heart and passion for sharing your love of the arts with so many in your community. Georgiana “Gia” Pacheco, a native of Montebello, is co-owner and an attorney at the Law Offices of George B. Pacheco and Associates. Gia shares her talent by volunteering as the secretary of the Montebello Police K-9 Association. This non-profit group is dedicated to finding resources for the Montebello Police Department’s K-9 Unit. Gia assists by organizing fundraising events, from deciding on a location, to recruiting volunteers, to assisting with the event. 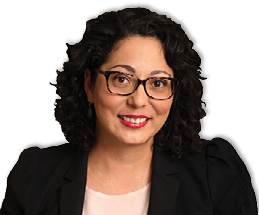 Gia is also an editor for the local newspaper, “Montebello Reporter.” Through her monthly column, “Ask an Attorney,” she provides legal advice, free of charge, to her to community. She also volunteers her time as a legal resource, conducting presentations for residents of Montebello. 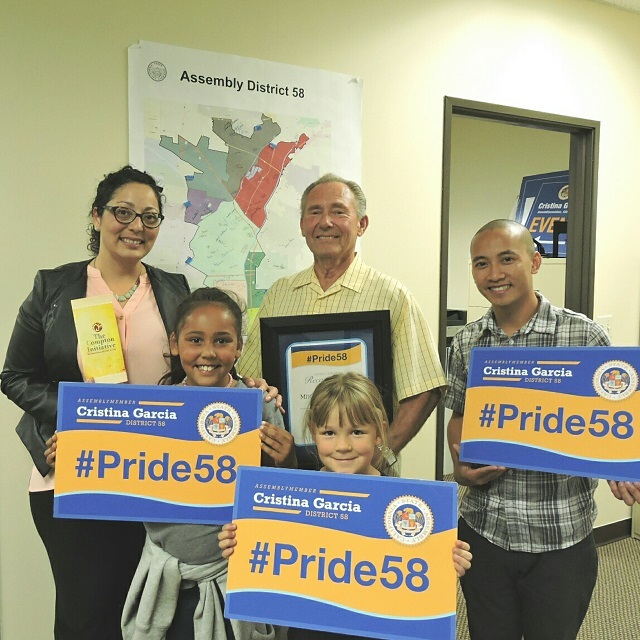 Among her activities, Gia has been a judge for the Montebello Lions Club speech contest and a volunteer for the Montebello Unified School District Pathways. She is a strong advocate and supporter of local businesses in the community. Often Gia and her staff take time away from their own busy office to support new business grand openings and other celebrations in Montebello. Gia Pacheco you are a great model of a young adult serving and sharing your talents. Thank you for caring and for going the extra mile for your community. As a long time business owner of Anaya Service Center in Bell Gardens, Juan Anaya is more than your average business owner. Mr. Anaya has been in the automotive repair business for over 24 years. He has a unique way of making others feel important. He is a very giving person who always treats each customer as a friend. He is known to be flexible and empathetic towards his customer’s circumstances and has many loyal customers who would attest to this selfless quality. 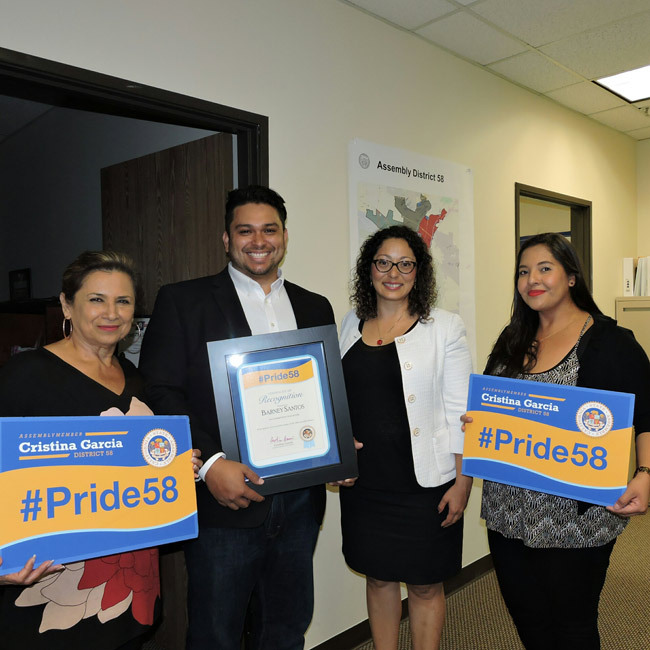 Aside from managing his business, Juan spends his time volunteering as a past president and a current board member of the Lions Club of Bell Gardens. He has taken the responsibility of being a leader in their annual carnivals, golf fundraising tournaments and many other events and has built a great relationship with the community. 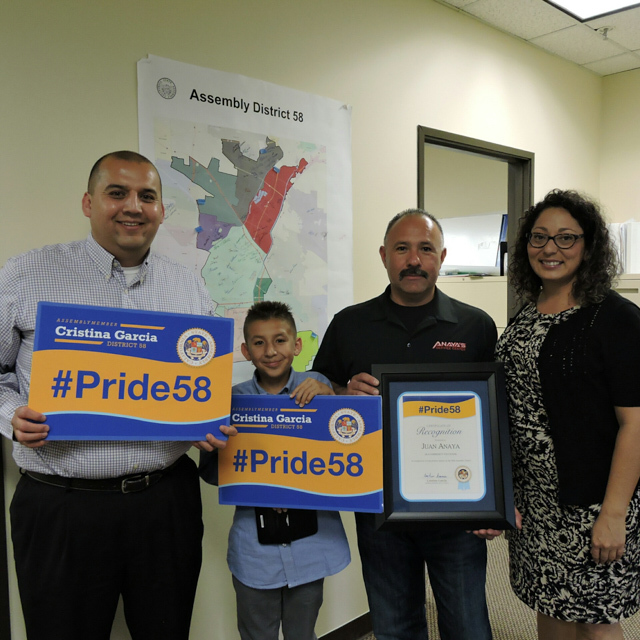 No matter how busy he may be, Juan always makes it his priority to help his community - with the Lions Club and as an active member of the Bell Gardens Chamber of Commerce, while at the same time never ignoring the needs of family and friends. Thank you Mr. Anaya for being a great friend to the community and an understanding businessman. Your commitment to Bell Gardens is greatly appreciated. 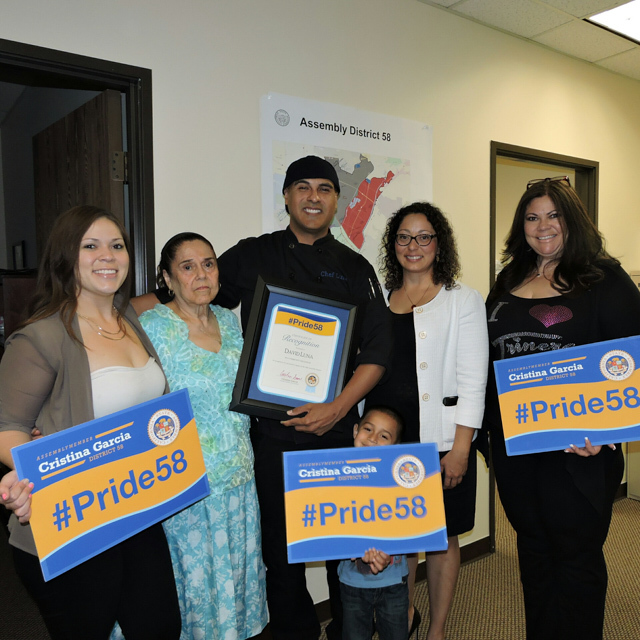 Chef David Luna is an extraordinary role model for the youth of our community. Chef Luna’s ROP Food and Nutrition class (Culinary Arts), is an exemplary program that has changed lives in the Pico Rivera community. Not everyone will become a chef, but through real life examples Chef Luna shows students how to apply the skills they learn in his program to their regular academic courses. He teaches students how to make the best out of almost anything and has helped his students develop a variety of skills that they can apply to almost any situation. Communication skills, time management, networking, critical thinking, and problem solving are just a few examples of skills that each of his students have now learned or improved on under his tutelage. Aside from being a wonderful chef and teacher, Chef Luna is a humanitarian who serves his homemade meals to the homeless on Thanksgiving. He is also available for every one of his students twenty-four hours a day, seven days a week. He has dedicated his life to his work and it is rare to see someone enjoy their work as much as he does. Thank you Chef Luna for showing the community that it is possible to love one’s job and care enough to share one’s gifts with others. Mitch is a long time resident of Bellflower. 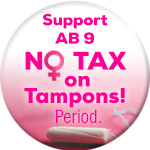 He is a retired L.A. County Fire Department Captain. Since his retirement, Mitch’s schedule is always busy, filled with volunteerism and leadership in his community. Mitch is a hands-on volunteer, sorting and assisting with inventory at the Affordable Treasures thrift store in Bellflower. The proceeds from Affordable Treasures go towards supporting local charities in Bellflower, such as Valley Christian Schools, Artesia Christian Homes, and Bethany Children Services. In addition to helping in his hometown of Bellflower, Mitch lends his time to neighboring cities - Paramount and Compton -assisting in beautification projects for both cities. As a man on a mission, Mitch also volunteers numerous hours per week with the Compton Initiative, an organization that mobilizes over 2,000 volunteers to complete beautification projects in the city of Compton. Thank you Mitch for being a standout - generously giving your time and energy to the city of Bellflower and beyond. You are an example for others and your efforts today, will impact your communities for many years to come.